After another stress free journey on the London underground, with the wonderful general public- (the “british-ness” of polite queuing goes to pot in that underworld) – my friends and I found ourselves walking the streets of Islington. We were heading for the Union Chapel where we were to see the beautiful Brooke Fraser perform that evening. 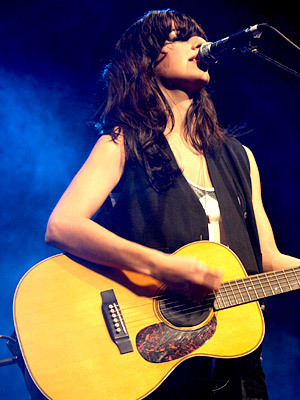 Compared with other Australian artists such as Lisa Mitchell and Missy Higgins, Brooke’s soft melodies resonate with meaning, character and soul. Although the outer appearance isn’t much to desire, with scaffolding and building work, the inside of the chapel makes one of the most stunning venues I’ve ever been to. Still a working church, it’s very small and enclosed- great for a small gig. I personally see music as a spiritual experience, so to be sitting on old pews, with candlelight surrounding the stone walls, red light swarming up the pillars and a beautiful great, big glass window ahead of me, the atmosphere was set. Brooke and her band followed the opening song with the track Orphans Kingdom. With such a majestic pulse, the song was greatly complimented by the drummer playing with heavily covered gong sticks so as to encourage a heavy deep beat. Her drummer himself created quite a stir in the audience (similar to how I remember John Butler’s band performed); he vividly put himself into the music. His focus was set high and steady, but his body and facial expressions moved intrinsically with the beat he was playing. Deciphering me was very memorable. This may be because it has a personal nostalgia for me, but for the live performance Brooke and her guitarist, Michael Chaves who has worked with John Mayer, enhanced the effect pedals for the guitar dramatically- I hate to be cliché but during one riff it really did personify an ocean. Half way through the gig, Brooke did a shout out for a Brazilian girl in the audience whose boyfriend had pestered her management for months with emails. It transpired that romance isn’t dead- he had asked her to tell his girlfriend that he loved her. C.S.Lewis was the track on the agenda; a song that I think definitely grows on you. The atmosphere in the Chapel was sincerely poignant. With tracks such as Albertine (which is based on Brooke’s experiences in Rwanda), there was a great sense of emotion in her lyrics. Something that a lot of guitarists have started doing is called “air tapping”. I personally know this to be Eric Mongrain’s forte, which he started doing a few years ago now. It was endearing to see Brooke attempt new musical techniques, such as this, with such timidity. However, once she got into the track, she became much more comfortable and it made quite a performance. The band also covered Coldplay’s Cemeteries of London, which was extremely different from the original. Brooke began very low, sounding quite tribal and then built up, layering and elongating the original notes- I think she would have made Chris Martin proud. Brooke’s Something in the Water tour is focusing on her new album, Flags, which was released in the UK on 10th April 2011. Unlike the very personal albums What to do with Daylight and Albertine, this third record seems a lot more character based such as the songs Betty, Crows and Locusts, and Ice on Her Lashes– again, another favourite, which in Brooke’s words, is a “meditation on the cycle of grief.” Flags itself was performed with very evocative piano, a soft building of drums and weeping, blues notes from the guitar. Sailboats (another chilled out record from the new album) was performed blissfully and I felt very content to fall asleep in the pews. Coachella was created after Brooke watched one of her favorite bands, Fleet Foxes. “It was a moment where I remembered the power of music as a language, a connector. I remembered that I’ve been given the gift of speaking a particular dialect of this language and realised I didn’t have the option of being resigned to silence and I didn’t want it.” The experience inspired the song Coachella greatly. As a musician myself, I felt exactly the same watching Brooke perform- she too enthralled the audience and I found myself singing harmonies to her music. During this last song, I found myself once again intrigued by the drummer’s characteristic playing, but also, how the guitarist was creating similar sounds to John Frusciante. The whole gig was much shorter than I’m used to, and much of the audience was waiting for more- I personally wanted her to sing Indelible. Although it was a small, personal performance, small but talented band, the whole gig was one of the best I’ve been to recently- she has always had great musicians with her but I felt this new album, which is very different to previous works, explores different techniques and sounds that compliment the narratives in her songs. Her vocals are iconic and combined with her meaningful lyrics, you really do feel like you’re in a state of reflection listening to her music.